The first round of the 2016 Formula Drift (Pro) championship took place this past weekend and four of my designs were on track. 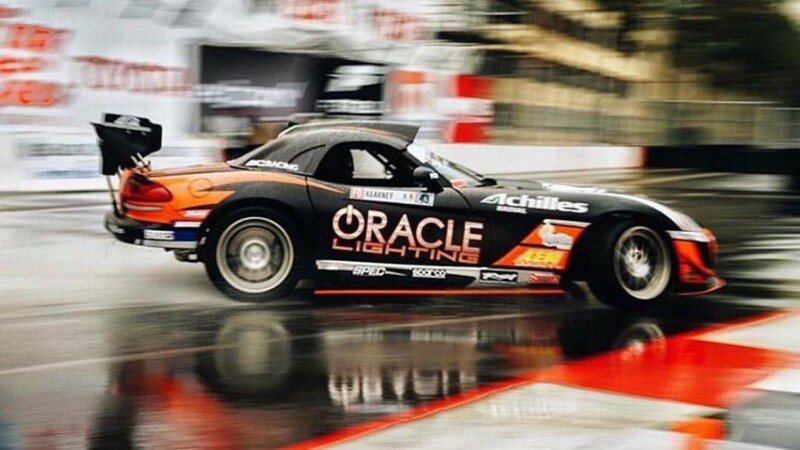 Dean Kearney continued with his Black and Orange livery on his awesome Dodge Viper as this proved to be very popular with the fans last year. Been a busy few weeks here at Andy Blackmore Design wrapping up Formula Drift liveries, some graphic and corporate identity projects and no less than four Spotter Guides, three of which you can read about elsewhere, so individual posts and announcements had to be put to one side, so I’ll catch up with a quartet of Formula Drift entries, which I designed for 2015. I have worked with Tyler for a number of years and we hit upon a design based off the previous owner of the Camaro and the same basic look has remained the same all of the years. Its a dilemma drivers and teams have. Create something fresh for the new season and you have to rebuild recognition and any chance of using previous imagery goes out the window. Retain or develop a design and you build an awareness which is important in advertising. With the main sponsors using Black and White in their marketing, we decided to stick with the well known look and update elements of the design with Falken’s iconic Blue and Teal. Wrapped in AERO product by The Decal Source. I also supplied Tyler McQuarrie Racing with various graphics and layouts for branding and team shirts. 2015 see’s Tyler expand his operation, bringing his old Nissan 350Z out of retirement, to be used by Pat Mordaunt. Pat and the Kolab agency came to me after their original announcement and imagery and wanted a different take on the livery original shown. Pat was pleased, in his pre season press release he remarked “Working with Andy has been phenomenal. His creativity and attention to detail is unrivaled when it comes to car design”. Nice one, thanks Pat, great working with you! Charles Ng is another long term client. Many non drifters will recognise his name from the WTCC Where he campaigned an Independent BMW 320. Focus is now with drifting and as a top instructor with Mercedes AMG travelling around the world! Charles’s design was one of my favourites last year, clean and subtle and small aspects of Orange. For 2015, Charles wanted something vibrant, loud along with significant exposure from Maxxis Tires, his new sponsor. 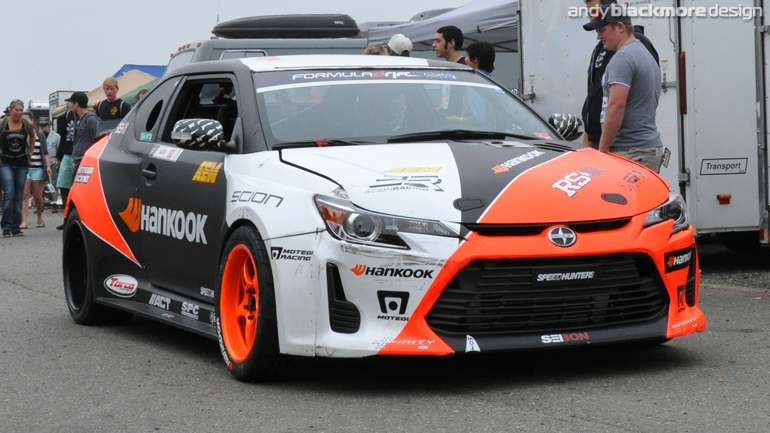 As it happens, I designed a new ‘global livery’ for Maxxis in 2014 and has already been seen on a couple of cars. We took the Maxxis look and personalised it for Charles, tweaking the design here and there. Was a bit of challenge due to the large number of sponsors Charles’ carries, but without these you don’t have a racing program. You won’t miss that in the dark! Final design is a new client, Oracle Client and Irish drifter, Dean Kearney. Dean has campaigned a Viper for a number of years and wanted an all new look this year. Feedback from previous liveries and more recent proposals were the logos and branding were hard to read, so they wanted a design with maximum contrast and clarity. The brief also called for an aggressive, menacing design using Oracle’s colours (Chrome on a Black base with Orange accents) and oversized logos. You’ll see Orange and Black is really in fashion this year. 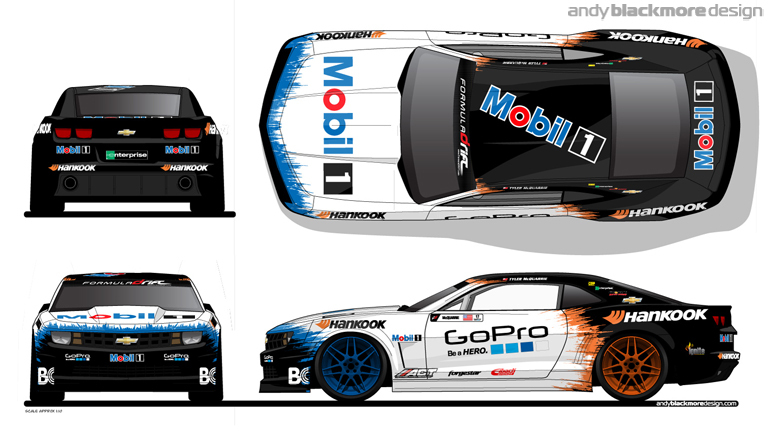 I’ve already done four liveries in these hues this year, plus Fredric Aasbo’s livery 2010-2014, so it can be a challenge to make sure each design is different and is fully resolved for the client. The final design proposal uses a Matte Black base, with some subtle Gloss Black drop shadows with accents of Orange and Chrome flashes to show off the Viper’s lines with branding, largely as before. I also created a suit design for Dean using this coloration and similar flashes of colour. Due to a lack of accurate line drawing and sweeping lines, large parts of this livery was cut on the car by hand by Daley Visual who did a great job bringing this and Pat’s 350Z to life. 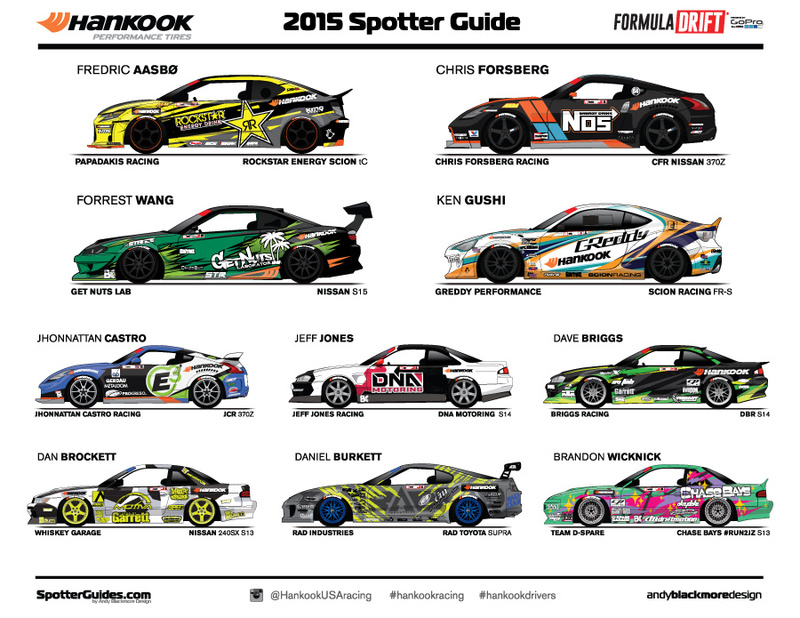 In addition, I was also recommissioned to produce the Hankook Tiire Formula Drift Spotter Guide again for 2015. One of the most popular guides in 2014 (only bettered by Le Mans!) 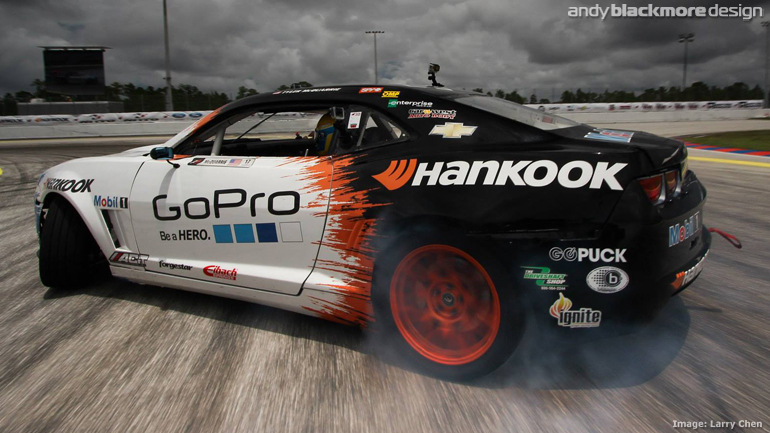 the guide features all the Hankook runners in Pro and Pro2 championships. You can download the guide at Spotter Guides.com, or grab a printed version at FD events from the Hankook area, or during the Autograph sessions. Good luck to all my clients past and present in FD this year. The 2014 edition of the SEMA Show in Las Vegas was a very special one for me. The SEMA show is the largest aftermarket automtive show in the world and one of the largest shows of any kind in North America. This trade only event attracts hundred of thousands of trade visitors and thousands of cars. This year, I had ten designs at the show including thee builds and eight debuts. It was amazing to see all the vehicles made even better with my design for the Scion Tuner Challenge, the ‘Speedhunters Maximum Attack Scion FR-S’ winning the competition and the debut of the Ken Block 1965 Mustang ‘Hoonicorn RTR ‘which I styled. 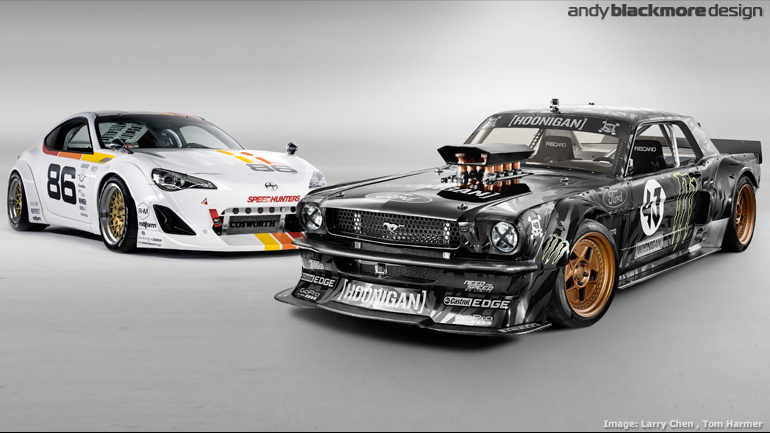 I hope the variety of designs from the Hoonicorn through to the all new global livery for Maxxis shows the diversity of design which I can create. More on each vehicle below. I took my now annual trip down, into the States for Formula Drift this past weekend. 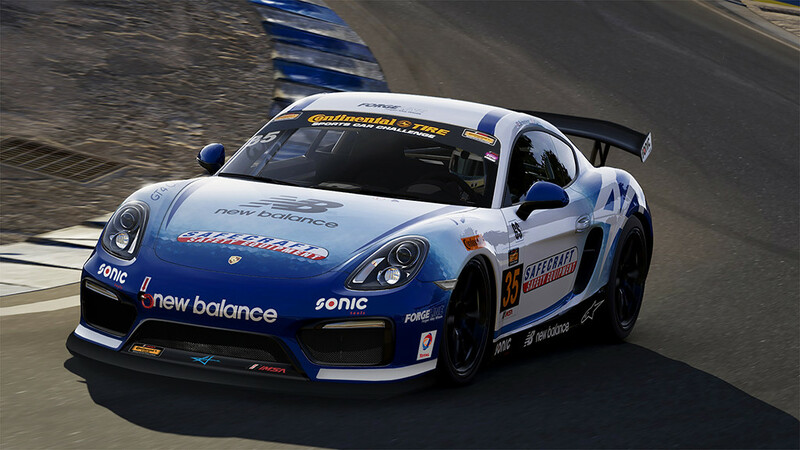 After a successful debut with Team Need for Speed in 2010, when I won the ‘Best Looking Car’ with Mad Mike Whiddett for the Team Need for Speed Mazda RX-8, I’ve always had a presence in the series. 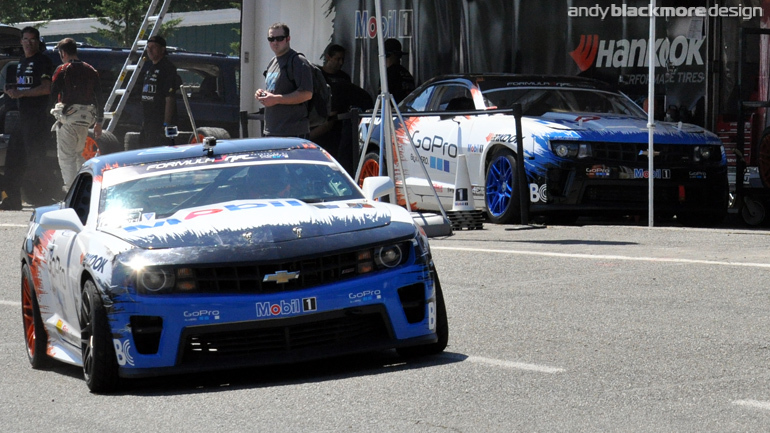 Existing client, Tyler McQuarrie Racing launched their updated Cheverolet Camaro at this weeks Formula Drift event. The team also announced INDYCAR Stat, JR Hildebrand will also compete in select rounds in the later half of the season. 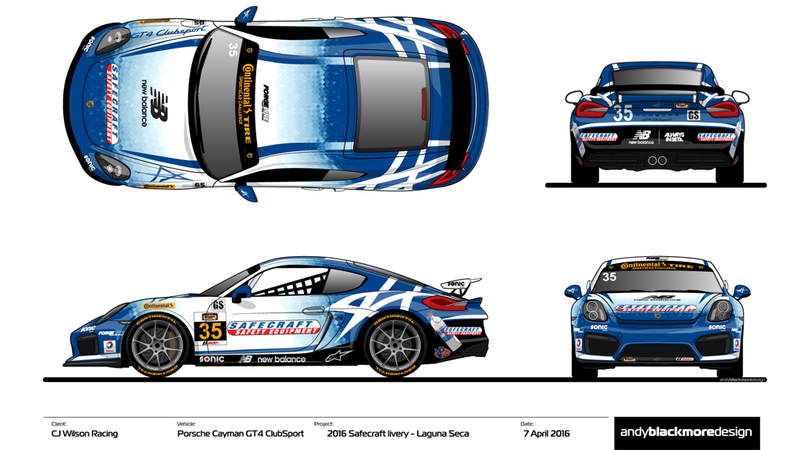 I designed the liveries of these cars, an update from the previous season with revised branding from Hankook and Mobil and coloration. JR’s car will have reversed colours on the front end. 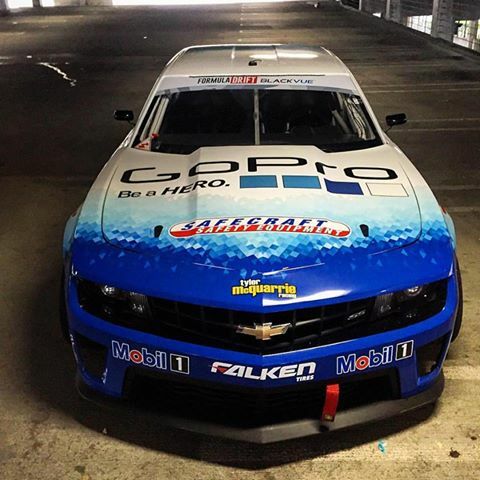 Tyler McQuarrie made his debut as team owner this past weekend in the opening round of the 2012 Formula Drift Championship with the ex Gardella Racing Chevrolet Camaro. Tyler contacted me after Gary Gardella recommended me to him in the closed season. We were able to work in the Go-Pro and Mobil 1 Sponsorship with a Gloss Black and Matte White design which continues the theme from the Gardella machine in 2011. 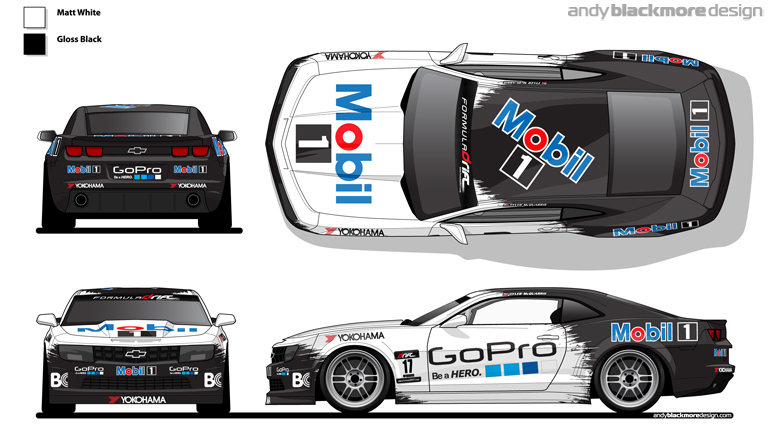 Mobil 1 also used my original artwork for stickers at the opening round.